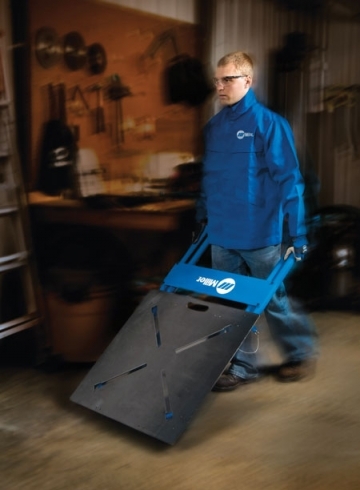 Designed to offer portability and space savings, the 30FX F-Series has a folding design, convenient handle and wheels that offer the ability to take the 74-pound bench to the job site or to move freely around a shop or garage. The 30FX model (30-by-30-inch F-Series with 3/16-inch X-pattern tabletop) has a list price of $247. • X-pattern tabletop makes clamping trouble-free and simplifies cleanup. • 1 1/2-inch diameter steel tube frame offers stability and support. • Wheels and a handle make the 74-pound bench easy to transport. • Removable gun holder provides storage area for welding gun. • Weight capacity is 500 pounds. • An optional 5-inch X-clamp accessory is available for $35. In this product category, Miller also offers the S-Series ArcStation, a stationary workbench designed for industrial pros and home hobbyists alike. The S-Series models start at $352 and are customized from there. Welders choose an approximately 30-by-30-inch or 30-by-60-inch table, a 3/16-inch solid or 3/8-in. X-pattern tabletop, and customize it with optional accessories, including X-clamps, tool chest, weld curtain, vise, and an assortment of shelving options.